You’ll find that quote here in yesterday’s free calendar printable. January is a month all about hope, New Year’s resolutions and inspiration. Here at Ruby & the Swallow, we are living by that quote for 2012. After a small seed was planted in our minds in August last year, we decided to go ahead and begin a small part of our dream... and the result has been this blog. So you see, you don’t have to be great to start – you just have to start to be great. Let this board of images inspire you for the New Year. Forget about what you failed to accomplish last year – that was then and this is now! What are your resolutions for 2012 and what motto do you live by? Comment on this post or on Twitter or Facebook. A picture is worth a thousand words, and inspirations boards are perfect for communicating what you want to say. Everything you get inspiration from, like photography, colour palettes, fashion, interior design and typography can be used to help establish a specific look and feel. 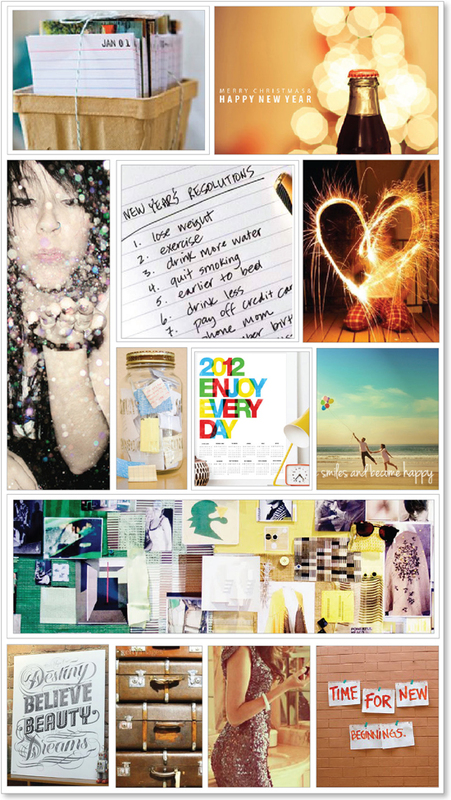 We will be posting many inspiration boards like this one in the weeks to come, so keep checking in!